Now here’s a brand we haven’t had a review of in a little while. 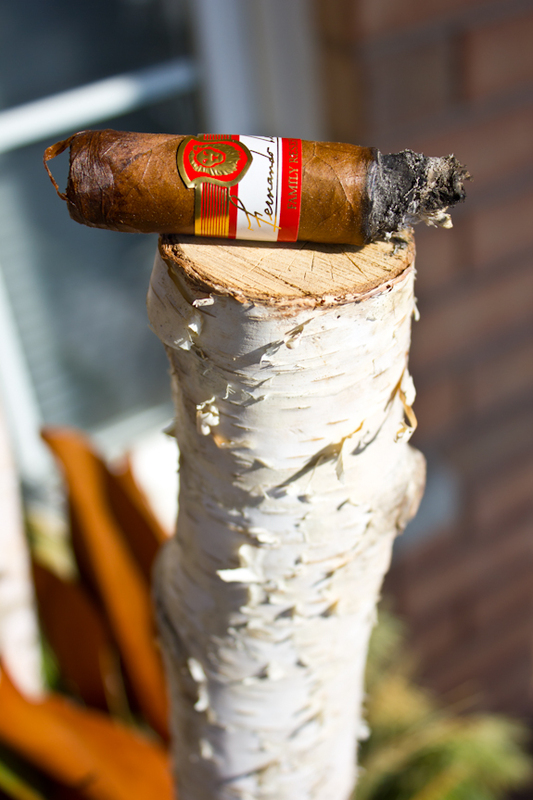 If you rewind a good chunk of time, you will see that at one point La Aurora was knocking out all kinds of new brands, including the very popular La Aurora 107 (which is still a very tasty stick). They followed up that success with Guillermo Leon’s own blend and line called the Signature series. Here’s the review of the Guillermo Leon Signature Series. 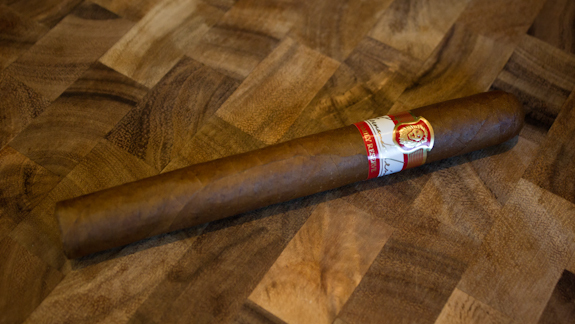 Also make sure to check out Jeremy’s contest+review post on the Aging Room – Small Batch M356! 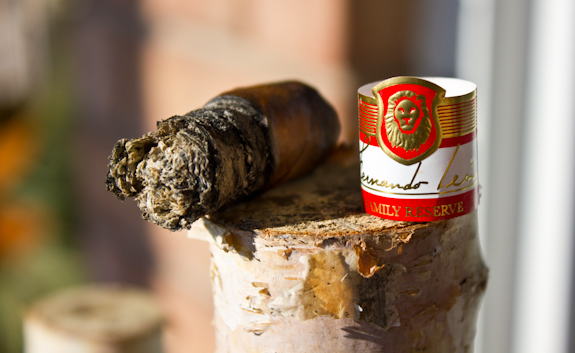 Now today we have a new blend from La Aurora called the Fernando Leon Family Reserva. Fernando León Asensio was the “Father” of La Aurora and passed away in 2009. This particular blend was actually made for personal consumption and reserved for friends and family only. 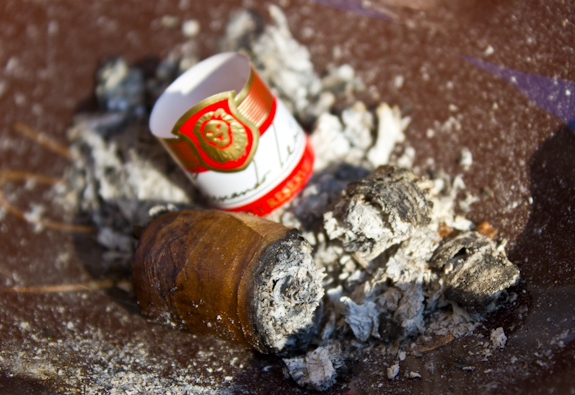 To commemorate his father, Guillermo Leon decided to push out this special blend for the masses to enjoy. 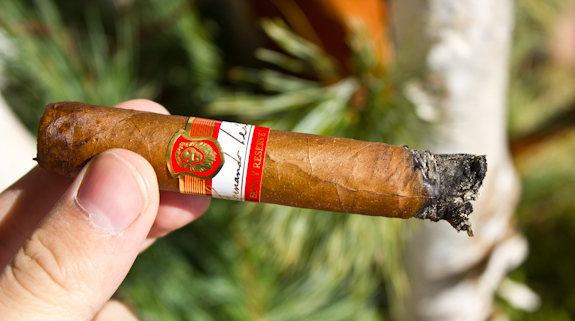 The cigar comes wrapped in a very similar band to what the Guillermo Leon Signature had, only with a different color scheme. The lion logo still adorns the top middle of the band and instead of Guillermo’s signature, we have Fernando’s signature in gold print across the middle of the band. 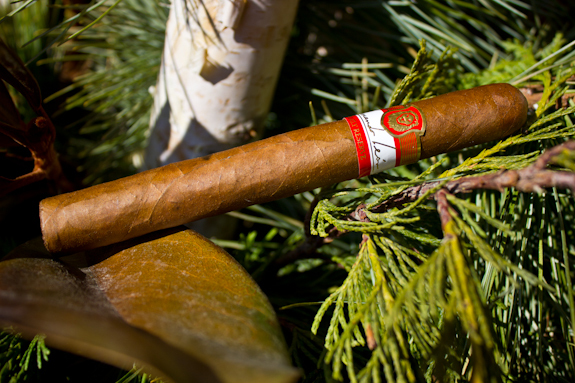 The Fernando Leon Family Reserve comes in the same classic sizes as the Guillermo Leon. 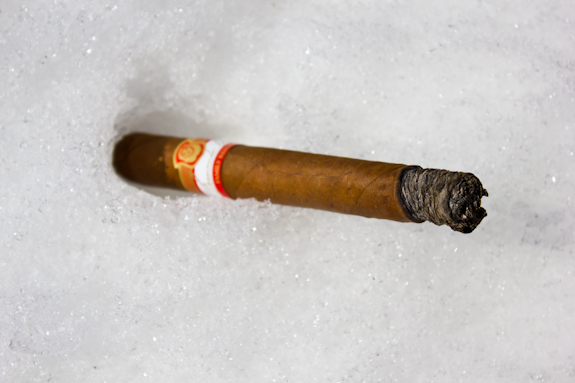 A Corona, Corona Gorda, Robusto, Belicoso and Gran Toro. For today’s review I’m picking up the Corona Gorda vitola, which is also becoming one of my favorites of all the vitolas lately. It turned out to be a warm(warm to me at least, it’s still only like 35F) afternoon with only a little bit of wind. So let’s get to it and see how this new cigar stands up! •	No burn issues through the first third, razor sharp and thin burnline, just the way I like it! 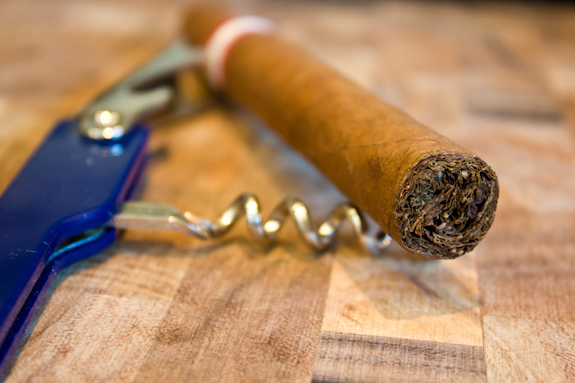 •	After that touch-up, we had smooth sailing right to the end, a very well constructed cigar! Today’s beer is actually a pretty rare find for me up here. Most of the local breweries tend to stick to typical stouts and dark ales and rarely venture outside of that territory. Welling Breweries took a step outside the comfort zone and came out with an Imperial Russian Stout. This brew clocks in at 8% alc./vol. and has a dark and thick consistency with a very thick head as well. The flavors bring lots of coffee and cocoa notes, but one interesting thing was that I was actually picking up some citrus notes. That made for a very interesting brew and paired quite well with the spice that the Fernando Leon had to offer. 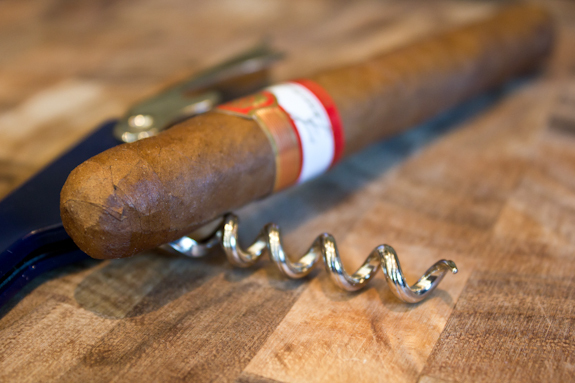 I’d like to try this cigar with a nice strong coffee as well, maybe with a little cinnamon sprinkled in there! Thanks for the review, Daniel. 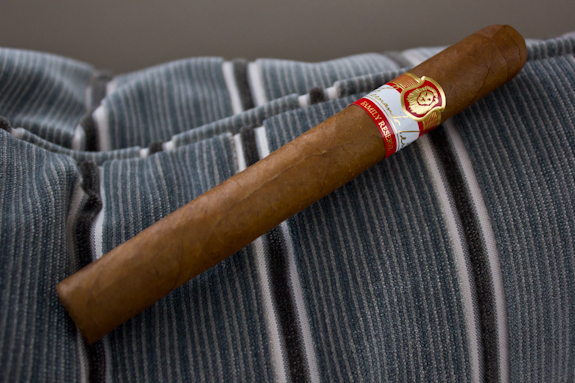 I’ve been wanting to try this stick, since i’m also a big fan of the Guillermo Leon. Hope you’re enjoying your heat wave. Been off the grid for a bit! Quality as usually D!